Idlewild is an amusement park about 40 minutes east of Pittsburgh, near the historic town of Ligonier. It’s positioned as a “family” amusement park, and definitely caters to kids, particularly younger kids. There are a few thrill rides here, but apart from a small (though worthy) old wooden coaster, you won’t find rides here that you wouldn’t find at a local fair. The permanent attractions are a bit more interesting. The oddest part of the park, for me, is called “Storybook Forest.” Storybook Forest is simply a long, winding path past a number of set-piece sculpted panoramas and the occasional costumed teenager. Each panorama is based on a children’s story, fairy tale, or nursery rhyme. Apart from the voices of children and their parents, it’s quiet – the wooded locale helps instill some tranquility – and fairly meditative. There are some unhappy and depressed looking farm animals in pens scattered throughout to provide additional color. Bo Peep’s sheep. The three little pigs. This is the innocence gap; this is the chasm. All through Storybook Forest I’m confronted with the urge to mock, to denigrate, to poke fun at. I can see the scuffed paint and the decrepit shingles, and I can see that Snow White really can’t wait for her cigarette break, and I can see that the animals just want to be left alone, and the whole thing just seems sad and depressing to me. But the children love it. They’re seeing something I can’t see, and I’m seeing something they can’t see. The grinning Jack in the Box reminded me of Tillie. In Coney Island, on Surf Avenue, I would ride my bike past the ruins of Steeplechase Park, the place that defined America’s very notion of “amusement park.” My older relatives would get a faraway look in their eyes when they talked about it. To me, it was like looking at a dinosaur’s bones; the parachute jump in particular, skeletal and immense, beckoning from the Verrazano Narrows Bridge, showing me the way to my family and a place to play punchball. 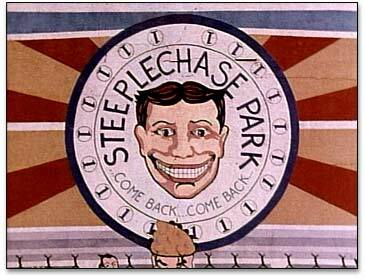 And always the smiling clown, Tillie, shouting “come back…come back…” to the deserted lot he presided over. When I was very young, I thought he was talking to me, making a promise. As I grew, I decided his face was disturbing, and his cry was a threat. Now, with time and distance, I pity poor Tillie, and I figure that he was simply begging someone, anyone, to come back and not leave him alone in his dark empty lot. He is the spirit of Coney Island, weeping for the vanished masses. This is, after all, why we hate clowns: they are the makers of broken promises. To grow old is to be battered by the fine print of life, to learn that a promise is only as good as the one making it. In the tattered decadence of the Three Little Bears’ house I see every lie told to me as a child. The group of first graders behind me, who haven’t yet had to start keeping track of that, see only a good story made real. You can’t stop time from moving forward, and you can’t stop children from discovering their own truths about the world. But you can treat a child’s innocence with respect. And so I present these pictures from Idlewild without the mocking captions I originally wrote for them, without the knowing wink and the wry smile. I’ve left out the digression about overpriced amusement park food, and the complaints about screaming toddlers and grumpy parents. And if the pictures themselves are framed to mock, or to accentuate the grotesque – as the Jack in the Box photo above certainly is – then I apologize, and ask you to look again from another angle, where perhaps a less cynical vision can prevail. Perhaps Tillie’s shout of “Come back” is, after all, just an invitation.